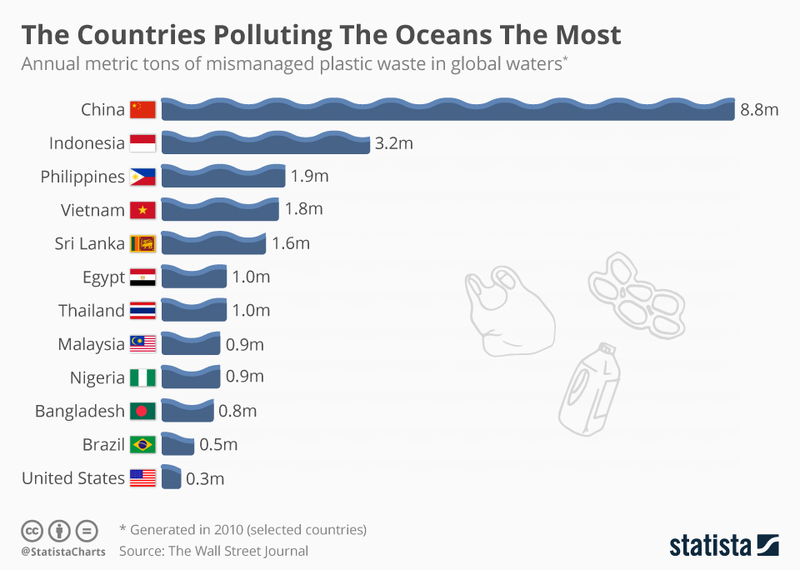 Yet even if all those straws were suddenly washed into the sea, they'd account for about .03 percent of the 8 million metric tons of plastics estimated to enter the oceans in a given year. The impact of this junk goes well beyond pollution. Ghost gear, as it's sometimes called, goes on fishing long after it's been abandoned, to the great detriment of marine habitats. In 2013, the Virginia Institute of Marine Science estimated that lost and abandoned crab pots take in 1.25 million blue crabs each year. Are drinking straws a minor source of oceanic plastic pollution, and is their detrimental impact fairly minor compared to other sources of plastic pollution? Yes. Drinking straws are a relatively minor source of oceanic plastic pollution. That is in perspective: Plastic drinking straws are a big problem in itself. But in comparison that problem is still a much smaller problem than commonly perceived or claimed to be. 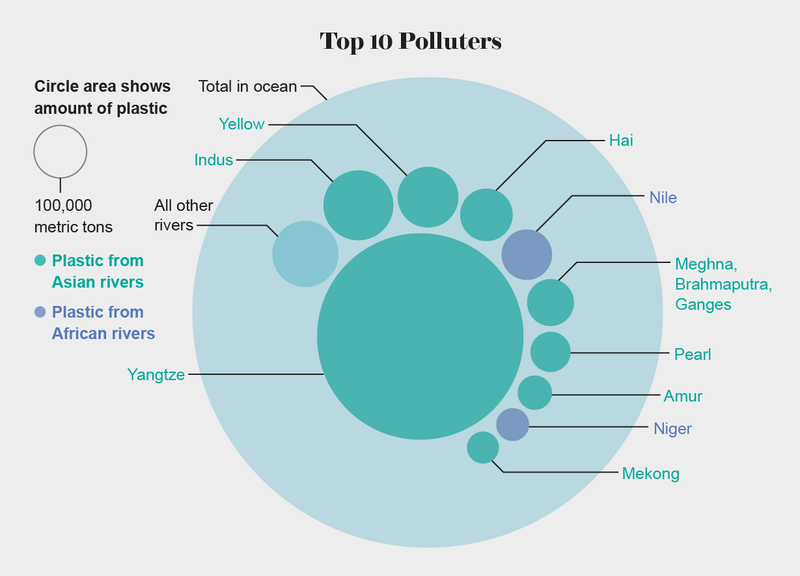 Other sources of plastics for ocean pollution are bigger in numbers, weight, direct or indirect impact on ocean life. Probably most of us have seen the horrendously emotional "turtle suffers from straw in the nose" video from 2015. Seeing this will have an impact on the watcher that is pretty much disconnected from any reasonable thought and certainly not very conducive to think in statistical terms about this problem. In contrast to entanglement, all items except paper bags were deemed to pose at least a small threat via the risk of ingestion. The items known to be ingested by seabirds, sea turtles and whales are all found among the top 20 items collected during Ocean Conservancy's annual International Coastal Cleanup. In this study, food packaging, straws and stirrers and plastic utensils in particular were scored high by respondents. These are also some of the most common items found on beaches and waterways, but not all have been well documented in the scientific literature as posing threats to marine-wildlife to date. When looking purely at numbers, experts in the field are focused mainly on other sources of danger to marine life and environment. While the scientific study of marine debris and its ecological impacts is relatively new, insights are growing rapidly as marine ecologists focus on this topic. Scientific knowledge is most robust around impacts from entanglement, likely because this impact is easiest to observe in nature, especially between derelict fishing gear and large animals. Comparatively less is known about ingestion and there is currently a poorer understanding of chemical contamination effects on wildlife. Entanglement of marine animals in marine debris, especially derelict nets and other abandoned fishing gear is widely recognised as a major source of mortality. The findings reported here substantiate this idea, with pots, lines, traps, nets, and buoys ranking as the highest threat to marine taxa, including sea turtles and marine mammals. Given that fishing gear is intentionally designed to ensnare and capture fish, it is expected that lost or intentionally discarded gear would continue to ensnare both fish and other marine taxa, with considerable risk of death by exhaustion or suffocation. When compared to other consumer items discarded in the ocean, fishing gear clearly poses the greatest ecological threat. Plastic bags and balloons, however, were also found to pose considerable entanglement risk to marine taxa. While balloons are generally small compared to plastic bags, they are often associated with a length of twine that likely poses the greatest entanglement threat. Plastic bags generally have handles which pose an entanglement risk as well as a 3-dimensional structure that creates a space in which an animal or parts of an animal can become entwined; indeed, plastic bags have been shown to entangle pinnipeds. 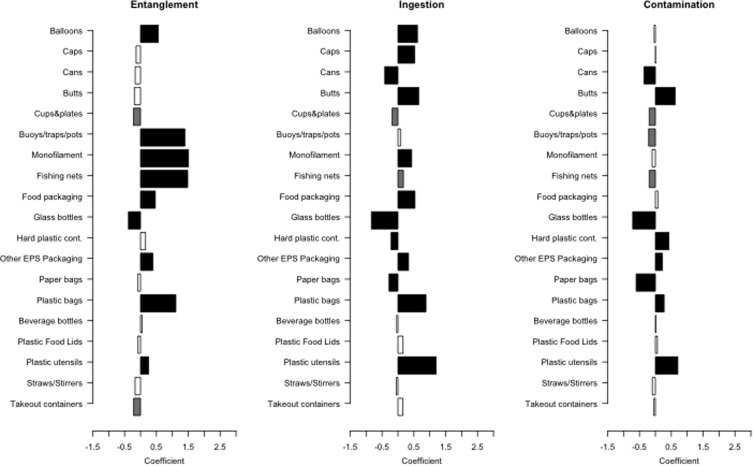 The expert elicitation findings reported here confirm that compared to most other consumer plastic items, plastic bags pose one of the greatest impacts to ocean wildlife and thus, from an environmental impact perspective, plastic bags warrant the specific attention they have received from governments and advocates to address their use. Chris Wilcox et al. : "Using expert elicitation to estimate the impacts of plastic pollution on marine wildlife", Marine Policy 65 (2016) 107–114. All the above is just ranking the more or less direct threat items might pose, if they get into ocean. Longer term effects are not covered but they are likely to grow if the plastics are ranked for "time to breakdown" (relatively low for straws) and "level of contamination" like complex metal binding, flame-retardants etc (relatively low for all food-grade plastics). Plastics in the marine environment are widely recognized as a global issue. Current international strategies and policies to reduce single-use plastics (plastic bags and microbeads) are reviewed. Many nations have adopted policies (since 1991) to reduce single-use plastic bags. A rising tide of policy strategies to reduce microbeads began in 2014, but are yet to be implemented. Dirk Xanthos & Tony R.Walker: "International policies to reduce plastic marine pollution from single-use plastics (plastic bags and microbeads): A review", Marine Pollution Bulletin Volume 118, Issues 1–2, 15 May 2017, Pages 17-26. How does this relate to in numbers? Australian scientists Denise Hardesty and Chris Wilcox estimate, using trash collected on U.S. coastlines during cleanups over five years, that there are nearly 7.5 million plastic straws lying around America's shorelines. They figure that means 437 million to 8.3 billion plastic straws are on the entire world's coastlines. But a ban may be a bit of a straw man in the discussions about plastics pollution. Straws make up about 4 percent of the plastic trash by piece, but far less by weight. Straws on average weigh so little—about one sixty-seventh of an ounce or .42 grams—that all those billions of straws add up to only about 2,000 tons of the nearly 9 million tons of plastic waste that yearly hits the waters. Steve Russell, vice president of plastics for the American Chemistry Council, said people can reduce waste by not taking straws, but "in many cases these plastics provide sanitary conditions for food, beverages and personal care." The key to solving marine litter, Russell says, is "in investing in systems to capture land-based waste and investing in infrastructure to convert used plastics into valuable products." Seth Borenstein: "Science Says: Amount of straws, plastic pollution is huge", Phys.org, April 2018.
there are some much sorer problem spots to tackle than banning plastic straws there for huge gains (in this case: reductions) for the environment. And while this may all seem like rather dismal news, the (relative) bright side is tangible. Given that so much of the pollution is coming from just a few sources, managing that waste could have a big impact. The authors conclude: “Reducing plastic loads by 50% in the 10 top-ranked rivers would reduce the total river-based load to the sea by 45%.” Which would prove challenging in and of itself, but at least knowing where to aim some effort is a good start. To be clear: Not a single plastic drinking straw should end up in the ocean or on its shores. But arguing with straws likely contorts the issues. The Yangtze alone pours up to an estimated 1.5 million metric tons into the Yellow Sea. Hopefully, the above does not read too much as anti-environmentalist, or even anti-Chinese? So let me include this one additional tidbit: One thing to ponder about: how much of the waste landing on the ocean through these rivers was properly catched on land, but then shipped off into the regions where they are not properly recycled, and perhaps released as the problem we do perceive these plastics now? In 2002, International Coastal Cleanup volunteers in 117 countries collected 1.8 million cigarette butts and cigar tips, representing 31 percent of all trash items. ... In 2002, International Coastal Cleanup had collected more than 8.2 million pounds of refuse, including 16,554 condoms, 16,144 tampons, 22,759 diapers, 255,972 straws and stirrers, 335,070 plastic bags, 347,137 glass bottles, 360,104 aluminum cans, 423,820 plastic bottles, and 675,360 food wrappers. So, with a typical straw having a mass of 0.4 grams, this would be 100 kilograms of straws and stirrers out of 3,700,000 kilograms of coastal trash, or 0.0026%. For 2018 the International Coastal Cleanup recovered 9,285,600 kilograms of trash which included 643,562 straws and stirrers. Based upon 0.4 gram straws, this would correspond to 0.0028% of the coastal trash by mass. Not the answer you're looking for? Browse other questions tagged environment pollution oceanography plastic . Are we running out of drinking water so that we need to be frugal with it?